NJax is one of those applications that are not exactly malicious, but you still need to be really wary of them. What is more, users can easily avoid installing similar applications if they employ safe web browsing habits. Yet, it is very often that users do not recognize the potential threat behind the likes of NJax, and they do not care about their internet security. Even so, if you are a security-minded computer user, you will have to remove NJax from your system because in the long run this adware application can expose you to potentially corrupted content. Adware applications cannot be considered malicious infections because users often install them willingly. The same applies to NJax. Our research shows that users install this application bundled with freeware. The program is usually distributed in third-party file sharing websites that are in Portuguese. We have to assume it because NJax is obviously oriented towards computer users in Portugal, Brazil, and the USA. This also means that the program does not enter your system surreptitiously, and you have to be very careful about what you install on your computer on a regular basis. If you need to download some program, make sure you do that via the official website. NJax is not your average adware application because it does not generate annoying commercial pop-ups, and it does not try to make an impression that it is there to help you save money on your purchases. Instead of that, NJax redirects your Google search to Yahoo search engine and modifies the results. To put it simply, if this adware application is installed on your PC, each time you search something on Google search engine, the moment you press Enter, your search query will be redirected to Yahoo! search engine, but the redirection will occur via NJax servers. This also shows that you cannot trust the results you see on your screen. It is obvious that Yahoo! is legitimate and reliable search provider, but when search engine results get affected a third-party adware server, you can be sure that they cannot be trusted. Although NJax does not try to infect you with malware, you can never know who will exploit this application for their own gains. Adware programs often become tools in corrupted online marketing schemes, and they might even be exploited by malware distribution. Whichever way it might be if you are experiencing constant redirections to Yahoo! search results, NJax has to go. Open Control Panel and remove NJax manually. Since there are bound to be more unwanted applications on your computer, run a full system scan with the SpyHunter free scanner. Do not hesitate to acquire a licensed antispyware tool if need be. Select Uninstall a program and remove NJax. Open Uninstall a program and remove NJax. 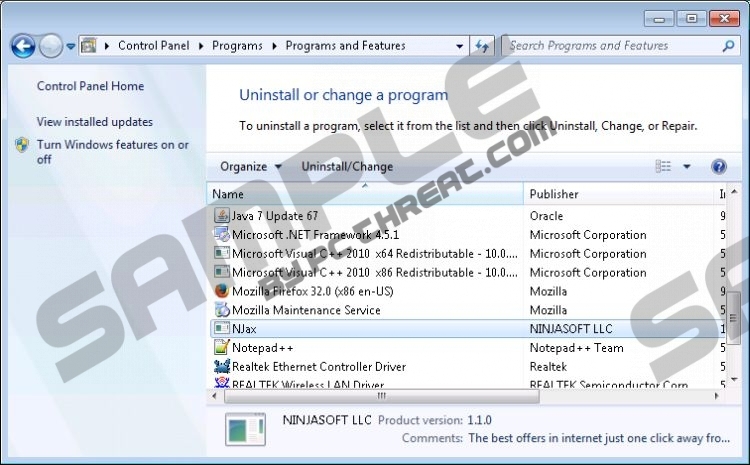 Select Add or remove programs and uninstall NJax. Quick & tested solution for NJax removal.